The New England Jazz Alliance (NEJA) inducted five new members into the New England Jazz Hall of Fame in a well-attended ceremony on Sunday, May 17th at the Cambridge Family YMCA. 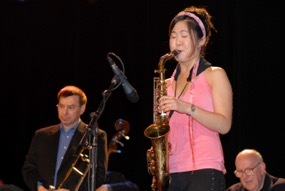 NEJA established the Hall of Fame in 2001 to honor the contributions of New England jazz musicians to the rich musical heritage of the area. This year’s induction ceremony was emceed by Ron Gill, the outgoing NEJA president. 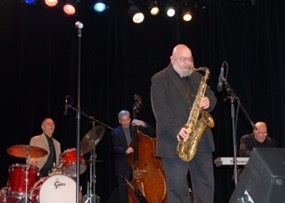 The five musicians honored were clarinetist Edmond Hall, trumpeter Max Kaminsky, saxophonist Jimmy Mosher, pianist Dean Earl, and trumpeter Joe Gordon. 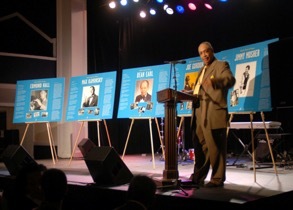 Gill introduced each honoree by unveiling a display board detailing the musician’s contributions to the New England jazz scene and by playing a musical selection from his career. Members of the Earl and Mosher families attended the ceremony. The five new inductees expand the Hall of Fame roster to twenty. Previously inducted members are: trumpeters Ruby Braff and Bobby Hackett, saxophonists Harry Carney, Serge Chaloff, Paul Gonsalves, Gigi Gryce, Johnny Hodges, Boots Mussulli and Sonny Stitt, pianists Jaki Byard and Nat Pierce, drummers Alan Dawson and Tony Williams, bandleader Sabby Lewis and arranger Ralph Burns. Display boards for all twenty members were on display at the ceremony. Gill presented a special plaque to honor the services of retiring NEJA Vice President and cofounder Burt Walker. Incoming NEJA resident Ed Bride honored Gill with a plaque commending him for “a job well done” in completing his three year stint as NEJA President. Leo Curran, a co-founder of NEJA and one of its directors, passed away in September, 2008. An all-star group of Leo’s friends presented a musical tribute in honor of his strong contributions to jazz education and his tireless efforts to attract young people to jazz. A Milford, MA native, Curran was road manager for the Stan Kenton Orchestra in the ‘40s and ‘50s and, with his dear friend Boots Mussulli, co-founded the Milford Youth Orchestra in the mid ‘60s. If you or your organization is interested in bringing the New England Jazz Hall of Fame exhibit to your institution or to your special concert, festival or event, contact NEJA President Ed Bride by calling (413)442-7718.